Meg of New Threads has posted a couple of sewing workshops to be held in January 2016 that I will be teaching using Simplicity patterns. 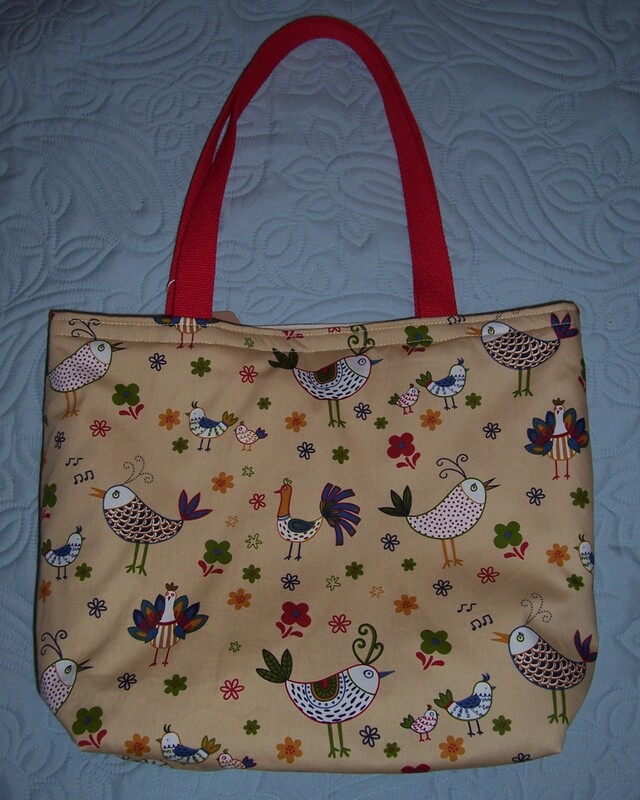 The first is for a basic bag that I have made several times as gifts for my sewing friends. As a demonstration for the pattern, Simplicity 2164, I have made up view B in a charming 100% cotton print called French Hens on Cream. 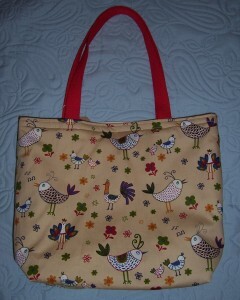 The pattern calls for the bag to be padded for which I used a 2 oz polyester wadding. The lining is in 100% cotton calico and has a slip pocket, there is a removable plastic bag-bottom-stiffener and the handles are made from 100% cotton webbing in Bright Cerise Pink. This bag design is a great starter project for new and returning stitchers that also provides lots of opportunities for development, to add your own individual “stamp”, e.g, patchwork, applique, embroidery and straight line or free motion quilting. The second workshop is for a stuffed toy. 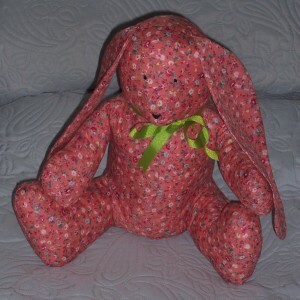 Simplicity 8044 which has patterns for a Dog, Bear and Rabbit. I made view B – the Rabbit. I used another 100% cotton print, a ditsy floral on a Salmon Pink background. This is a great pattern that uses only 1 metre of 114 cms wide fabric and there are only two pattern pieces. Seam allowance is only ¼ inch so you have to take care to ensure that raw edges are level and that there are no gaps in the stitching through which the stuffing can escape later! The most time-consuming part of construction was stuffing and then stitching up the back. 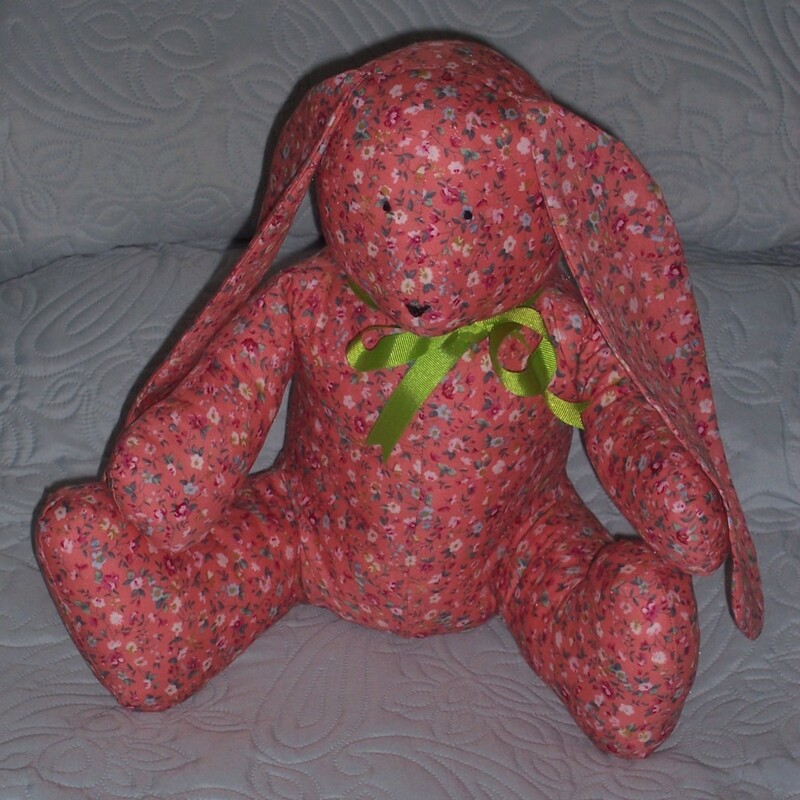 The rabbit sits squarely on her shaped bottom and measures approximately 14 inches high in that position. Although because of the fabric choice my rabbit is definitely a girl, by changing the print this toy would also suitable for a boy. NB. If the toy is to be given to a young child then the features must either be embroidered or omitted and the ribbon bow around the neck should be removed to prevent any accidents.